We have all been there, waiting for the perfect moment when the light is at its best and suddenly... light rain starts. You have one option, put the gear back in your camera bag and wait for the rain to stop, then start all over again. Some people carry a plastic bag and cover the camera. It is one solution but not the best as this only protects you from light rain. You can also have an ordinary umbrella with you but again, you have to hold it yourself and this means you are left with only one hand free. I have been looking for ages for a proper solution, one that leaves my hands free and yet, protects my gear. However, it's not just the rain that your gear needs protection from, it is also the sun. During a sunset or sunrise shoot, especially when the sun is on the front and sidewise of the lens, it will definitely cause sun flare – or at least, it will result in less contrasty images. With the umbrella's flexible and highly adjustable arm, you can now block out the sun from your lens and achieve flare free and contrasty images. 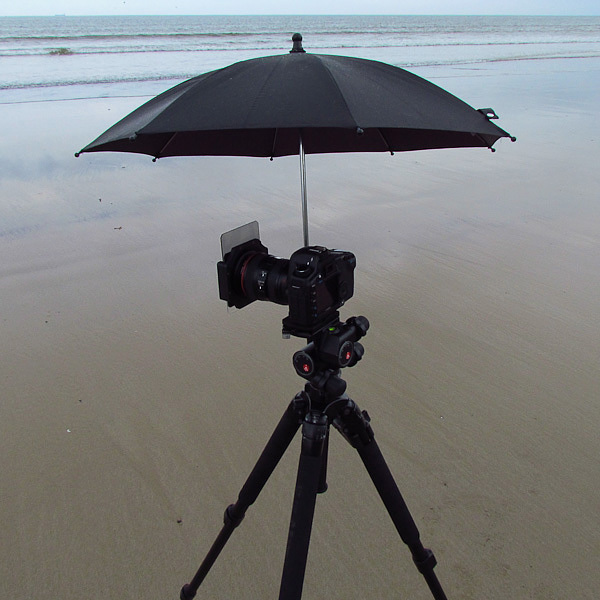 As a landscape photographer I found the umbrella to be invaluable for what I do and the time I spend on location. The only drawback is that you can not use it when it's windy. The umbrella's diameter is 75cm when open and the total length is 85cm. The arm splits in two pieces, which makes carrying even easier. Payment is via Credit Card or Paypal. You can convert our prices to your local currency by using our currency converter on the sidebar. If you live outside the United Kingdom, please choose the option on the right. This option includes all countries in the world apart from the United Kingdom. How is the umbrella attached, on the tripod or? The umbrella is attached to one of the tripod legs with a clamp.